Fox Business' host Stuart Varney was peeved when a former ICE director started laughing at him when he began calling migrants heading to our border - an invasion. John Sandweg threw a dose of reality on Varney and Trump's caravan invasion claptrap and fearmongering by telling him these people usually just seek asylum, legally. 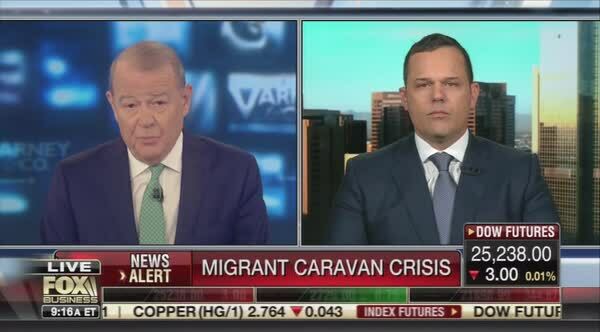 Varney opened the segment up by trying to whip up fear in his viewers by proclaiming there are four migrant caravans heading to the border now and asked John Sandweg what would happen next. Sandweg calmly said, "Well, what we've been seeing, generally, is that caravans themselves have been actually walking up to our ports of entry. So, rather than sneaking across the border, the caravans actually walk up to the ports of entry, get there, and say, "I want asylum in the United States." Varney asked, "What do we do?" We don't shoot them, Stuart. Sandweg replied, "The good news is this: They're all screened, they go through biometric and biographic background checks. So we're able to find out whether there's any bad information about them historically, including information we get from Central America. Once there -- this is where problems come in -- they go through the court system where they get to present their claims for asylum." He said the real problem was not enough judges and people to properly deal with them in a timely fashion. After saying only about 10% of these migrants are granted asylum, Varney tried to up the outrage meter. Varney, "So, we're looking at the prospect of housing tens of thousands of people on the border, maybe in tent cities, for a very long period of time, is that what we're looking at? Sandweg, "Well, right now, generally, these people are released. They can be given an ankle bracelet. And the good news is, Stuart, 90 -- "
Varney, "Well, the president -- but the president says no, we're not going to catch and release. We're not going to do that. Sandweg then gave Fox News/Business viewers a dose of reality instead of fear when it comes to migrants that go to our southern borders. Sandweg, "Well, right now, I know the president is saying that, but the reality is this: When you have 12,000 -- I mean, last month we have 16,000 Central Americans family members. ICE's capacity to detain families is only limited to about 3,000 beds nationwide, so just do the math. We know that large numbers are being released. The good news is the -- "
Varney cut him off to get back to his racist talking points. Varney, "Well, then, John, I've got to say, that sounds to me like an invasion. I know you don't like the use of the word, I understand that, but what else do you describe it as? You got tens of thousands of people, they walk in, and they stay for a very long time, and we put them up. That's an invasion." An invasion happens by an armed military force, Stuart and not by white nationalist talking points. Merriam-Webster defines an invasion thusly: incursion of an army for conquest or plunder 2: the incoming or spread of something usually hurtful. Sandweg, "Look, this is a humanitarian crisis. I mean, the majority of these people have no -- they pose no threat. The overwhelming majority pose no threat." Varney became furious and cut in as he defended Trump. Varney, "No it's not, it's a border crisis." Sandweg began to laugh at Varney. Varney, "Come on, you can't laugh like that." Sandweg mimicked Varney, "It's a border crisis." Varney, "We're being swamped, and it's deliberate." Sandweg continued, "What I'm, saying is, I've dealt with security crises, and there are some bad people crossing that border. Generally, this population, are families fleeing -- desperately fleeing poverty and violence. They're not entitled to asylum, the overwhelming majority. The good news is, they won't get it. The only real problem here is how slow we are in handling these cases." Varney was glad their time expired and said goodbye.